Well, things are certainly moving along at a brisk pace here in the Pleasure Dome (my office). As you may recall from my previous blog on this topic, my chum Duane Benson and I decided to create our own prototyping shield for the Arduino. Originally, we dubbed this the Bodacious Bensonfruit Arduino Uno/Mega Proto Screwshield, but we now refer to it as the Universal Screw-Block Proto-Shield System for Arduino. Why the name change? There are a number of reasons. For example, we originally thought of our proto-shields only in terms of Arduino Unos and Megas, because these were the only types of Arduino we own. But then we realized that our system would also work with Arduino Dues and Leonardos, along with any chipKIT equiavlents, hence the universal part of our new moniker. The really exciting news is that we’ve decided to make this into a Kickstarter project. We started to research the use of the Arduino name on Kickstarter. It turns out that you aren’t allowed to say things like “Arduino xxxxxx.” Instead, you have to say “xxxxxx for Arduino,” which explains this portion of our name change. I’ll be talking about our Kickstarter project in the not so distant future, but first I wanted to bring you up to date on the state of play. The first boards are back from the manufacturer and shown below. We’ve since respun a couple of items (such as the silkscreens), but the fundamental design is unchanged. 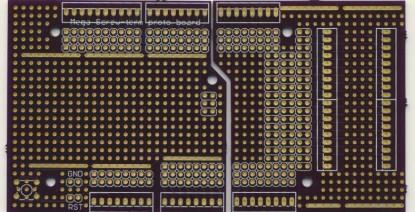 Top view of the Universal Screw-Block Proto-Shield PCBs. 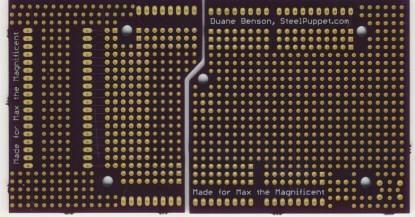 Bottom view of the Universal Screw-Block Proto-Shield PCBs. Of course, I immediately soldered all the headers, screw terminal blocks, and other components on to my Screw-Block Proto-Shields, and then I started to integrate them into my Inamorata Prognostication Engine project. My first task was to use the Screw-Block Proto-Shields to make it easier for me to connect my Adafruit RGB LCD Shield Kit to my Arduino Mega. Let me walk you through this step by step, so you can see just how cunning this is. Consider the following images, which show my Arduino Uno and my LCD Shield. First we see them laying side by side, and then we see the LCD shield plugged into the Arduino Uno. Now consider the following image of my Arduino Mega with the same LCD shield. This is the Arduino I’m using to control my Inamorata Prognostication Engine. Many shields designed for the Arduino Uno will work with Arduino Leonardos, Dues, and Megas — without any modification or messing around . Unfortunately, this is not the case with my LCD Shield, which is controlled via a two-wire I2C interface. One advantage of the interface is that we need only two pins to control the LCD display. Another advantage is that we can control a whole bunch of shields using the same two pins, because each entity on the I2C bus has a unique I2C address.